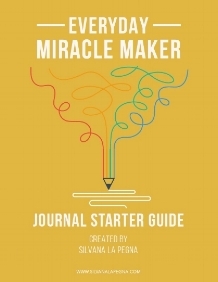 This Journal Starter Guide was created to help you get started journaling. Journaling unlocks your miracle-making mindset and invites everyday miracles into your life. Thank you! Check your inbox shortly for a confirmation email from me. After a couple of minutes, if the email still isn't there, check your spam or junk mail folder. It is important to add me to your address book if you'd like to receive further emails from me.